Create links on Facebook and other social media. You can create a status update that links directly to your interview, create an album of images from your art and link to the interview in the description or comments. Continue to add photos to your new online album so people continue to see your link. You can Tag the artists and galleries you have mentioned within your interview. You can even add your interview to your "About" section of your social media pages. Draw attention to yourself by doing something different. Have you considered making YouTube videos of your process? Repost your interview to Facebook every few months. Post your work on Pinterest. Image links direct back to your interview. Use Twitter. As a primer, check out this post on how to get started on Twitter. Create Permanent Links. Your website or blog may have a page specifically for Press/Links/Friends. Link to your interview and LAI there. Be sure to add this link to your MNartists profile. Continually promote your art and your own website. 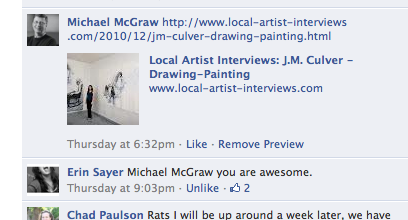 When people are interested in your art, they will check out ALL of your links. The more links, the greater your web presence, and the more page views you will get on all of your sites. I asked Christina Habibi and Kate Renee to give me their input on how to promote their LAI interviews. LAI regularly gets good traffic to their interviews so they must be doing something right. I have combined their ideas with mine for this post, but Kate Renee has created a stand-alone article that she uses when she teaches classes. See below. Local Artist Interview's mission is to create exposure and opportunities for Minnesota artists, but how does an artist continue to promote themselves and their LAI interview after the blog has been posted? As a fellow professional artist who had the opportunity to have an interview with LAI, I have linked, referred to, and repromoted my interview through a number of sources over the past year. Social Networking: The scope of social networking has multiplied over recent years. Not only can you post your interview on Facebook and Twitter, but also you can use Linked In and Google Plus. Post the link to your interview on your MNartists account, or post an image of your artwork that you included on your interview on Pinterest with a caption that links to the LAI site. One of the great aspects of social networking is that it is a constant feed of current activity. What is posted today will be replaced with new content. This means that you can repost your interview more than once. Content posted on a Facebook Fan page is only live on your fan's newsfeed for 24 hours. While I do not suggest reposting repeat links and content every day, consider posting it a few times a year. The constant growth in friends, fans, and followers on your various social networks means that someone new will get a chance to read your interview even if it’s a year or two after the blog interview was first posted. Some of this social networking promotion can be as simple as tweeting: Have you read my LAI lately? with a link to your interview. If you joined a new social network do not be afraid to post your interview as well. Each social platform will reach a different audience group. Link Love: Multiple direct links creates greater SEO (Search Engine Optimization). If you want to drive traffic (or readers) to your interview, embed the link in relevant and easy to locate sites such as your website or blog. Usually artist websites are a good way to maintain a digital professional portfolio and linking your interview to that is a great way for people from all over who view your portfolio, to get to know you a little bit better. Whenever you can stick in a direct link, do it! Consider blogging about your interview, LAI, or even guest blogging! Newsletters: This past January, I wanted to emulate the traditional Christmas letter but tailor it to my art career. I posted my digital newsletter on my blog and went month to month talking about the exciting artistic events and opportunities that I participated in during the year. I took this time to share my interview there so everyone who may not be on my social network sites could get the chance to read my interview. Emails: Another easy marketing tool to keep your LAI interview active is to have it as a tag on the bottom of your emails. 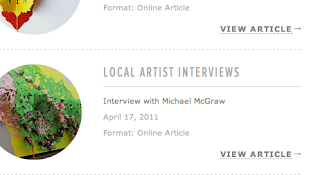 It’s handy for artists to have a link to their website but why not include your interview also? Verbal: Talk about what you are doing! Being a professional artist is a lifestyle so tell people what you are doing and share your artistic opportunities. Weather or not it’s your family, friends, colleagues, or other artists, show and refer people to your interview. One of the great aspects of the LAI interview is that it provides a unique and personal window into the world of the artist. The questions about process and work habits give a voice to each artist. So don't be afraid to direct people to your interview! Promote Others: In addition to talking about yourself and your recent artistic opportunities, talk about other local artists. 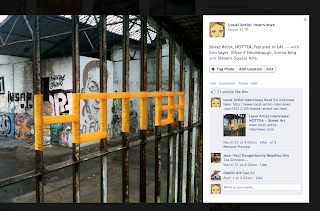 Refer their interview, website, and art. The art community in Minnesota is a close knit group of creatives, so get your foot in the door by talking about, promoting, and collaborating with other artists. Share LAI interviews that you enjoyed, artists you know, or artwork that inspired you. Keep your artistic relationships strong by reciprocating press and support for artists who help you. There is a section in the interview that asks for you to list artists you enjoy. This is a great place to list artist that you know, love, support, and work with. It’s also an opportunity to have other artists list you on their interview! So keeping your professional relationships healthy can reap benefits that drive support, readers, and additional traffic to your interview. Other Ideas: Why not create a small flier or hand out with your LAI interview URL. Or add the URL to your contact info on your business card? What about snail mail? Send your extended family or friends a card suggesting them to check out your interview. Do you list your interview on your CV and resume? Instead of making your LAI interview a one time blog post, keep it alive! Use these tips and tools to continue the longevity of your interview. Don't be afraid to get creative and find fresh new ways to promote yourself. Think of non-traditional advertising methods to continue keeping your art viewers and readers interested in you and your interview. Kate Renee is a professional artist focusing on acrylic character painting. She studied art, art history and design at the University of Minnesota. She is the creator and Director of the Solo Exhibitions Program at Altered Esthetics, a gallery in Northeast Minneapolis, where she teaches and mentors emerging artists with a focus on career guidance topics. She is also a business arts instructor for the Bloomington Theatre and Arts Center. Kate has another LAI guest blogging post about Artistic Organization which can be read here! 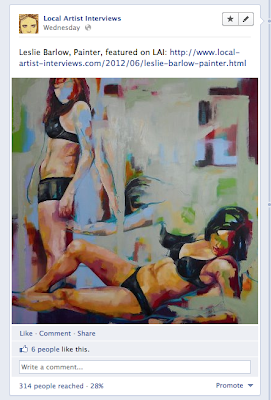 Check out her LAI interview and her art at: www.katerenee.com.